Barneys Warehouse has Extra 50% Off Men's Shoes. Shipping is free. Barneys Warehouse offers the Barneys New York Men's Lug-Sole Leather Bluchers in Brown for an in-cart price of $82.25 with free shipping. That's a savings of $398 off list and the best price we could find for these Italian-made shoes. They're available in most sizes 6 to 12. Deal ends February 3. Note: They're final sale and cannot be exchanged/returned. Barneys Warehouse takes an extra 75% off clearance items. (Prices are as marked.) Plus, all orders receive free shipping. That's the best extra discount we've seen on clearance items at Barneys Warehouse. Discounted brands include Barneys New York, Ben Taverniti, Calvin Klein, Chloe, and Derek Lam 10 Crosby. Deal ends February 3. Barneys Warehouse has 50% Off Sitewide. Extra 75% Off Clearance. Shipping is free. Barneys Warehouse continues to take an extra 70% off clearance items. It also now takes an extra 50% off with an additional 10% off most other items sitewide. (Prices are as marked.) Even better, all orders receive free shipping. Not only is it tied as the best extra discount we've seen on clearance, but the combined 55% off sitewide beats last week's mention of just 50% off. Save on brands like Balmain, Alexander McQueen, Valentino, Rag & Bone, and Fendi. Barneys Warehouse takes an extra 70% off clearance items. Plus, it takes an extra 50% off most other items sitewide. (Prices are more or less as marked, dropping a few cents in-cart.) Even better, all orders receive free shipping. That's the best extra discount we've seen on clearance items this year. Save on brands like Balmain, Alexander McQueen, Valentino, Rag & Bone, and Fendi. 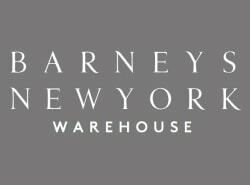 Barneys Warehouse has Extra 50% Off on Sale Styles. Shipping is free. Barneys Warehouse takes an extra 60% off almost all items sitewide during its Cyber Monday Sale. Plus, all orders receive free shipping. (Although the landing page advertises up to 60% off, we found that most items are marked at 60% off.) That's the best sitewide sale of the year from Barneys Warehouse. Discounted brands include Fendi, Givenchy, Prada, and Gucci. Some exclusions may apply. Barneys Warehouse takes an extra 30% off sitewide during its Autumn Wardrobe Sale. (Discount applies in-cart.) Plus, all orders receive free shipping. Designers include Tom Ford, Ralph Lauren, Miu Miu, Balenciaga, Calvin Klein, and Balmain. Deal ends October 10.